Is normal perception simply a controlled hallucination? How does the heart control our thoughts and feelings? How close are we to being able to repair brain damage? Could a game help to defeat dementia? The human brain is basically our control centre. Intelligence, creativity, emotion, and memory are a few of the many things governed by the brain. But what happens when it goes wrong? And what are neuroscience researchers and psychologists discovering about its abilities? This year’s Cambridge Science Festival lifts the lid and takes an in-depth look into the workings of the brain, from psychosis and dementia to how other systems in the body control the mind, and reveals some of the latest research into brain damage repair. The packed series of neuroscience and psychology events begins on day one of the Festival, 12 March, when Professor Paul Fletcher presents the latest research into understanding psychosis. He examines the experiences of psychosis to consider how they might arise out of the normal functioning of the mind during his talk, I’m not mad: I only bend reality so that I can see around the corners. Professor Fletcher explains how psychosis, though it can be bizarre, incomprehensible, and terrifying, is not so far removed from normal everyday experience as we might like to think, and even argues that normal perception is simply a controlled hallucination. He also provides examples of this and shows how we can use our growing understanding of ‘perception and belief’ in the brain to try to demystify psychosis. There are other systems in the body that can have an impact on how our brain controls our thoughts and feelings. On 17 March, Dr Philippe Gilchrist, discusses some of the relationships between day-to-day cardiovascular functioning and our thoughts, feelings and behaviours in his event From heart to emotion. He said: “When we experience stress, our body responds by releasing various chemicals such as cortisol and adrenaline, preparing us to meet the challenge. Our day-to-day cardiovascular functioning is intricately linked not just with our environment and general health, but also with our cognition, emotions, and behaviours. Usually when we think of acute stress, we think of the fight-or-flight response, including increases in arousal. However, certain forms of stress can also lead to paradoxical decreases in physiological activity, including decreases in heart-rate and blood pressure.” Dr Gilchrist discusses a series of experimental studies and developing research examining this paradox. Further developing research is explored in Food for thought: awakening neural stem cells in the brain (23 March). Stem cells in the brain can generate new neurons throughout an animal’s life in response to stimuli such as exercise, nutrition and injury. Professor Andrea Brand, Gurdon Institute, aims to understand the signals that instruct stem cells to produce new neurons at will. The ability to reactivate neural stem cells from a dormant state raises the prospect of future therapies for brain repair after damage or neurodegenerative disease, such as dementia. Professor Brand discusses new research in the field. Dementia is also the topic in Maps, monsters and mazes in the fight against dementia, (12 March). How can a game help to defeat dementia? Dr Saber Sami and Professor Michael Hornberger discuss how Sea Hero Quest, one of the world’s largest citizen science projects, is providing new insights into human spatial navigation and how this could help in diagnosing dementia. On 17 March, there are several events related to the brain and psychology. Professor Usha Goswami presents an overview of how brain rhythms determine speech rhythms and why this may be different in people with dyslexia during her event Dyslexia, rhythm and the brain. Dr Idalmis Santiesteban shows how current research contributes to an understanding of the processes that help us to not only connect but also differentiate from others in Distinguishing self from others: how do we do it? And Dr Susanna Mierau discusses how people on the autism spectrum perceive the world differently, including increased or decreased sensitivity to sights, sounds, touch, smell and taste, and how the altered sensation can affect their lives during her event, Sensory perception in autism: from the clinic to the laboratory. Brilliant brains: seeing science through art, 12-18 March. An exhibition exploring consciousness, including neuroscience research by Dr Srivas Chennu, Department of Clinical Neuroscience. God and epilepsy, 13 March. Professor Alasdair Coles (Department of Clinical Neurosciences) and Dr Joseph Tennant (Faraday Institute) provide examples of people who experience mystical epileptic seizures, and what they can teach neuroscience, psychology and theology. When the object of your actions escapes you, 14 March. Dr David Belin discusses the psychological and neural basis of impulsive/compulsive disorders. He offers a framework to understand how a behaviour, in some vulnerable individuals, becomes a compulsive habit. Making sense of the mind and brain, 14 March. An evening at the MRC Cognition and Brain Sciences Unit exploring research in psychology and neuroscience through hands-on activities and experiments followed by short talks. Molecules to memory: advances in dementia research, 14 March. Hosted by Alzheimer’s Research UK Local Network, this annual public event showcases current dementia research at Cambridge. Department of Psychology open day, 17 March. Interactive events and talks, exploring the intricacies of how we work, from controlling impulses and learning more about emotions, to the reliability of memory and discovering how our visual experience comes not only from what we look at, but also from what we have learnt about the world. How do brains learn about the world around us? 22 March. How does the brain piece together information from the senses to interact with a rapidly changing world? How does the brain learn and how does experience re-organise its functions? Does the brain need a personal trainer? Can you get an old brain to learn new tricks? Can we re-wire our brain through training? Dr Zoe Kourtzi answers these questions and more. Let’s talk about the sense of symptoms! 24 March. Combining psychoanalytic theory with clinical cases, Iro Zoubopoulou introduces principal psychoanalytical notions from both a Freudian and a Lacanian perspective. 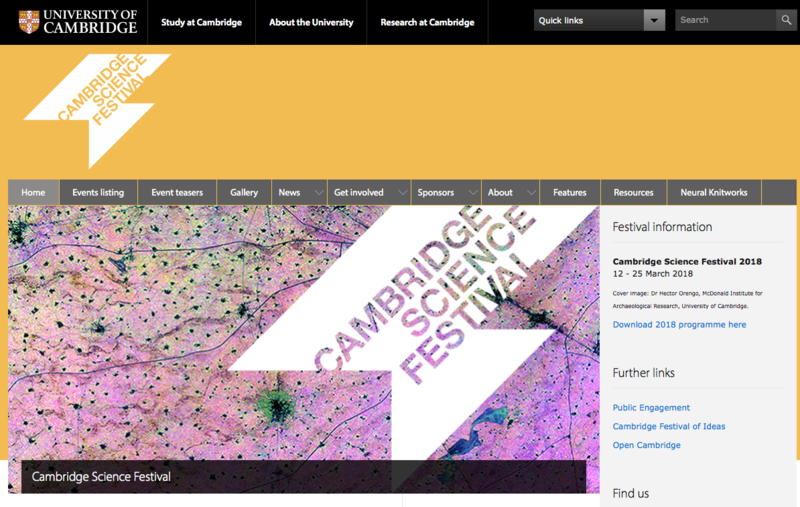 To pre-book events, visit the Cambridge Science Festival website, or call: 01223 766 766.